Experts find fault with the existing global financial institutions for not providing adequate capital for much-needed large infrastructure projects in BRICS and other developing countries. Think tanks from Brazil, Russia, India, China and South Africa (the so-called BRICS) have reached a consensus on creating a BRICS development bank designed to complement existing global financial institutions such as the World Bank, Xinhua said on Tuesday. “At the previous forum before the BRICS summit meeting in March, we were still discussing whether to create this bank, but now we are talking about how to create this bank,” Liu Youfa, deputy director of the China Institute of International Studies was quoted by the agency as saying. The 2012 BRICS Think-Tanks Forum, held in China's Chongqing Municipality was part of efforts by the five countries to create a BRICS development bank, the agency said. The establishment of such a bank joined the official agenda when BRICS leaders agreed at the New Delhi March summit to consider the possibility of creating a new development bank. Xinhua added that experts from the think tanks said in follow-up interviews that their agreement on the necessity and practicality of creating the bank would be presented to officials, who would advance the governments' decision making. Liu Youfa was cited by Xinhua as saying that think tanks are a preliminary step in government policy-making and the influence of their ideas in part depends on their feasibility and thoroughness. The consensus from the forum has three main aspects: the need to build a legal framework, the need to establish a theoretical framework and the need to further discuss technical issues, Liu said. The first of these concerns defining the legal status of the bank, the second was to explain its purpose, and the third was about how the bank should be run and capitalized and other specific matters. H.H.S. 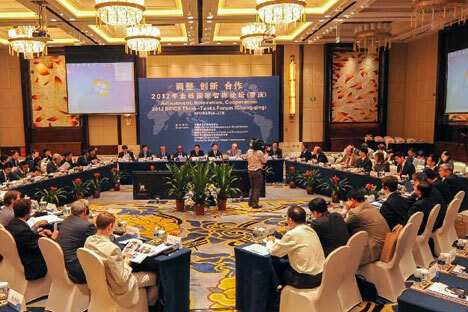 Viswanathan, a distinguished fellow of India's Observer Research Foundation, told Xinhua the meeting of the think tanks did not produce a report, but its discussion will surely be included in the report of the next forum, set to take place in South Africa before the next summit in 2013. Viswanathan told Xinhua that India expects to see the bank established as soon as possible. Although no timetable was set, a road map has become clear after this week's forum and all five sides are clear what to do next: figuring out the bank's form of organization, equity shares, head office and other issues. At the New Delhi summit, the BRICS leaders directed finance ministers to examine the feasibility and viability of the bank, set up a joint working group for further study, and report back to them before the next summit. When explaining why the BRICS countries need a development of their own, many experts found fault with the existing global financial institutions, in particular the World Bank, for not providing adequate capital for much-needed large infrastructure projects in BRICS and other developing countries, Xinhua said. Yaroslav Lisovolik, member of the Management Board of Deutsche Bank Russia, told the Chinese news agency that the bulk of world savings and financial resources was concentrated in the developing world, but the pattern of the past decade had seen developing countries channelling a significant part of their reserves into the developed world. For the BRICS, the creation of a development bank may support the institutional base of BRICS integration, Lisovolik tole Xinhua adding that for other developing nations, the bank could address one of the greatest reserves for growth in the world economy -- the development of infrastructure.